With around 7000km of coastline, more than 150 islands and the Great Barrier Reef spanning it all, Queensland is Australia’s most dreamed-about tropical destination. The trouble is, it ain't cheap. The cost of living in Australia is pretty high, but there are a few hideaways and deals that can make a trip to this incredible destination affordable even on a budget. With a little planning, you won't need to sell your grandma to reach castaway beaches like Whitehaven. Here are our choices for experiencing Queensland's Great Barrier Reef without busting out the gold credit card. Green Island is a tiny coral cay with only one resort. Luckily, the resort has restaurants, an ice cream parlour and watersports rentals that are all available to day trippers. It only takes about 30 minutes to walk around the light sands of this beautiful island, so chances are you’ll spend a lot of time enjoying the crystal blue waters and fringing coral reef, or simply lounge the day away on the beach. Great Adventures (greatadventures.com.au) runs the least expensive ferry option at around AU$90 return. Hamilton Island has the most to offer active types wanting to take a DIY day trip to the Whitsunday Islands. This is where to go for a wannabe resort experience inclusive of white sand beaches, golf, tennis, watersport rentals and tons of restaurant choices – and yes, day-trippers can access all of this. If you’re more of a nature lover, ditch the resort areas and trek on one of the many steep, view-filled walking trails, some that lead to more secluded beaches. To get there, just take a Cruise Whitsundays ferry from Airlie Beach and then, once you’re on the island, the shuttle buses are free. Big Fury offers one of the better value day cruises in the Whitsundays that will get you out to the famed Whitehaven Beach on Whitsunday Island and snorkelling for AU$130 including lunch. 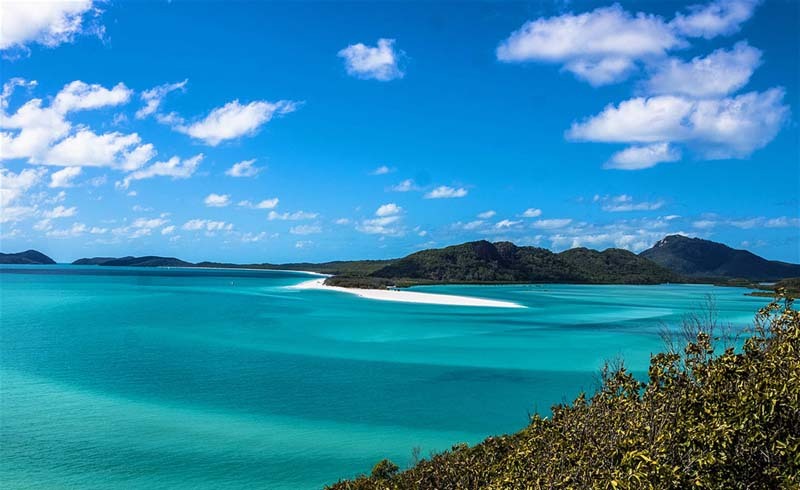 What is Whitehaven Beach? Often called the most beautiful beach in Australia, this is about as perfect and white, with the requisite lapping clear blue water, as you can get. It is worth the splurge. Lady Musgrave Island day trips depart on the family-run Lady Musgrave Cruises (lmcruises.com.au) from the Town of 1770. Yes it’s AU$190, but you can’t get to a more perfect tropical island paradise on this coast for less money. The uninhabited isle swarms with nesting seabirds and is rimmed by sparkling soft sands and live corals. The trip includes lunch, tea and a semi-submarine tour so it’s a spectacular way to spend the day. 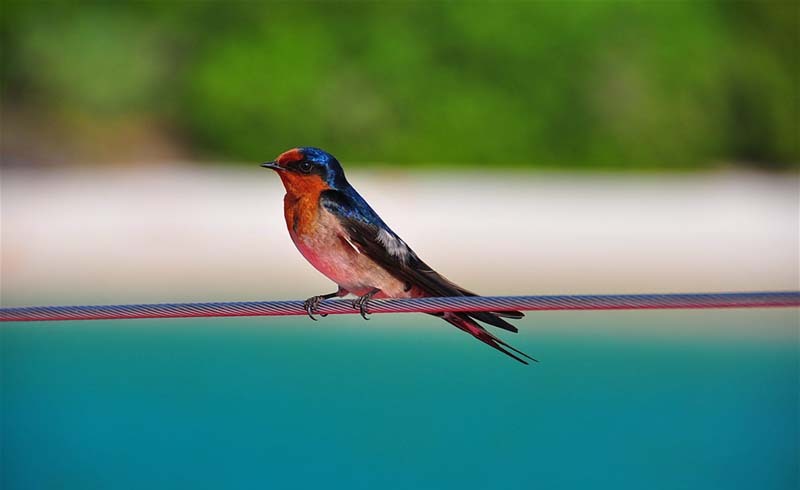 A welcome swallow perched on a sailboat in the Whitsunday Islands. Great Keppel Island is slated to be the next major resort on this coast, but for now it’s a serene paradise of empty beaches, hearty bush walks over steep, forested hills, and some of the best live corals that you can snorkel simply by hiking and swimming there (no expensive boat tour required). 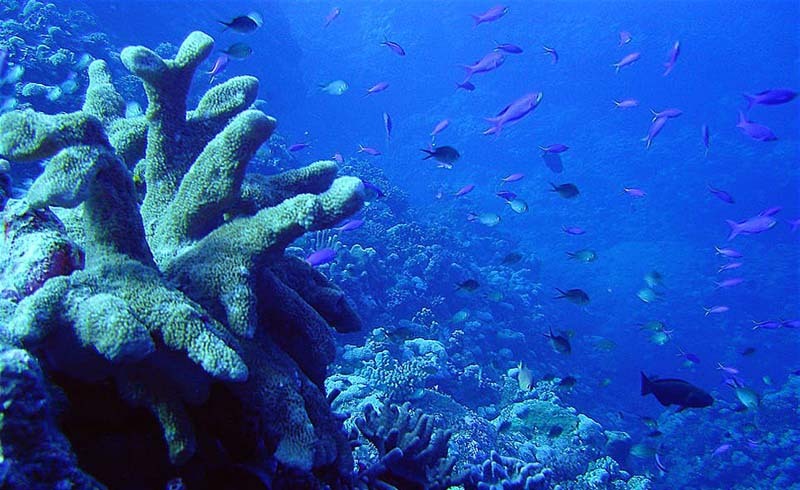 Diving and snorkelling in the Coral Sea off Queensland reveals a host of underwater treasures. If all this wasn’t enough, there’s plenty of simple, affordable accommodation ranging from the laid-back dorms and doubles at Great Keppel Island Holiday Village ( gkiholidayvillage.com.au), to the beachfront Great Keppel Island Hideaway (greatkeppelislandhideaway.com.au) where options include safari tents as well as classier rooms and cabins. There’s more good news on the food front with kitchens available to guests at both of the above-listed options (stock up on supplies in Yeppoon) and a basic supply shop down the road. If you’ve got the cash, dine on tasty and reasonably priced meals or sip a cold beer at sunset over the beach, at the Great Keppel Island Hideaway Bar and Restaurant. Getting to the island by ferry will cost you AU$55 return on Freedom Fast Cats (freedomfastcats.com), which compared to other island ferry transfers on this coast, is another bargain. 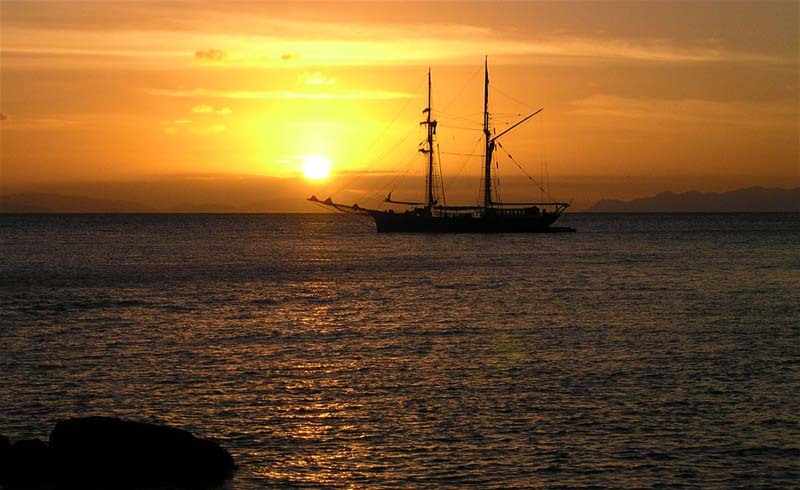 Shoreside sunsets in the Whitsundays will make you yearn to drop your anchor for long stay. Magnetic Island is a little island with a lot going on. It’s not one of those resort islands (although it has all the natural beauty of one), it’s a place where people really live and work. Eucalyptus-lined trails wind across hillsides that offer views over turquoise waters and dramatic boulder outcrops. 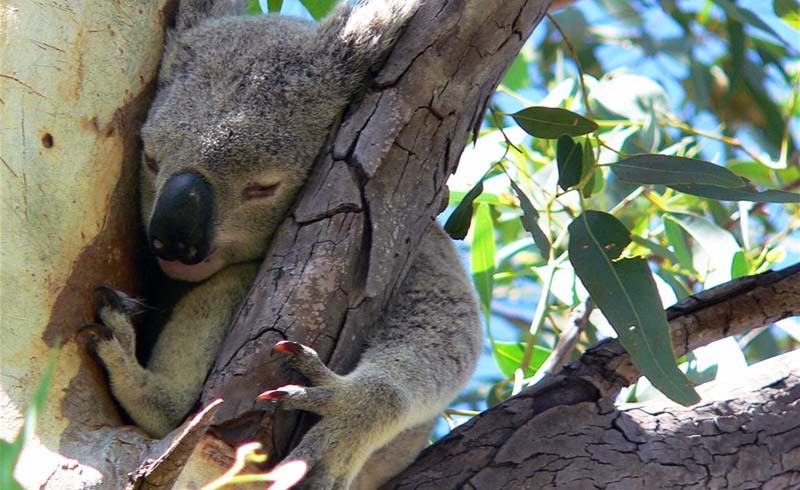 You’re likely to pass a dozing koala or three and walk to the tune of bird song. Hike to now-abandoned WWII forts then meander down to Bremner Point around sunset where you can hand-feed wild (and adorable) rock wallabies. Watersports on offer include scuba diving and sea kayaking. After a hedonistic blowout at the full-moon parties near Nelly Bay, you might just sleep as deeply as this koala. Yes, you could easily visit Magnetic Island on a day trip but staying overnight can be very affordable and gives you more time to explore the many beaches and villages. Bungalow Bay Koala Village over in the beach-bum style hamlet of Horseshoe Bay, feels like a wilderness camp and has its very own wildlife park where you can eat breakfast with the koalas. Camping, dorms and cabins are on offer plus there’s a fun vibe and a pool. Those wanting a different kind of wildlife should head straight to full-moon partying Base Backpackers on its own little beach near Nelly Bay. Don’t expect much sleep beyond what you’ll get baking in the sun midday. Lots of package deals from the website can make this option an even better deal. Get to Magnetic Island on either the Sealink (sealinkqld.com.au) or Fantasea (fantaseacruisingmagnetic.com.au) ferries with prices from AU$25 return. Once there you can get a full day bus pass for around AU$7.50, hike everywhere, rent a bike or a little buggy known as a 'moke'. 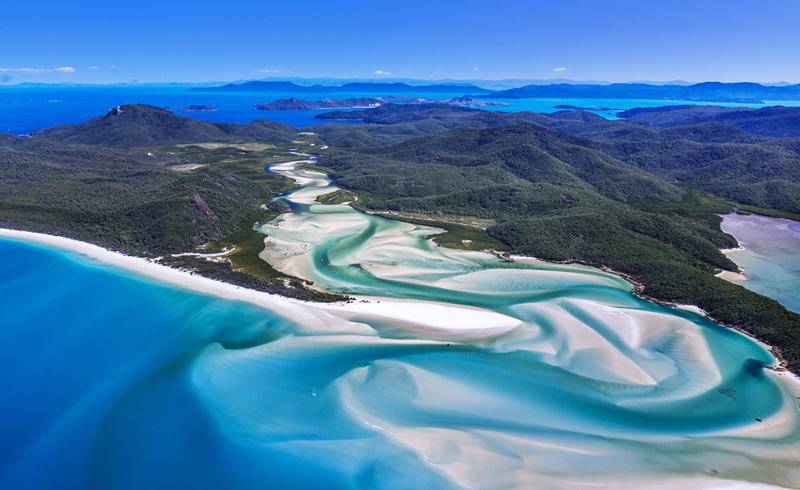 Paradise found: an aerial view over Whitehaven Beach in Queenland's Whitsunday Islands.